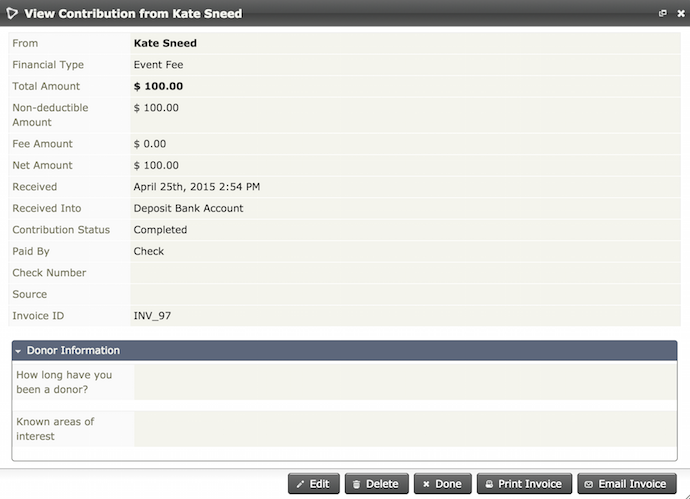 Invoicing works for all Financial Types and Completed and Pending Contribution Statuses and has to be enabled. To enable invoicing go to Administer > CiviContribute > CiviContribute Component Settings and check the "Enable Tax and Invoicing" box. Once Invoicing has been enabled, you can easily email or print invoices for Complete or Pending Contributions from a contact's Contribution Tab. 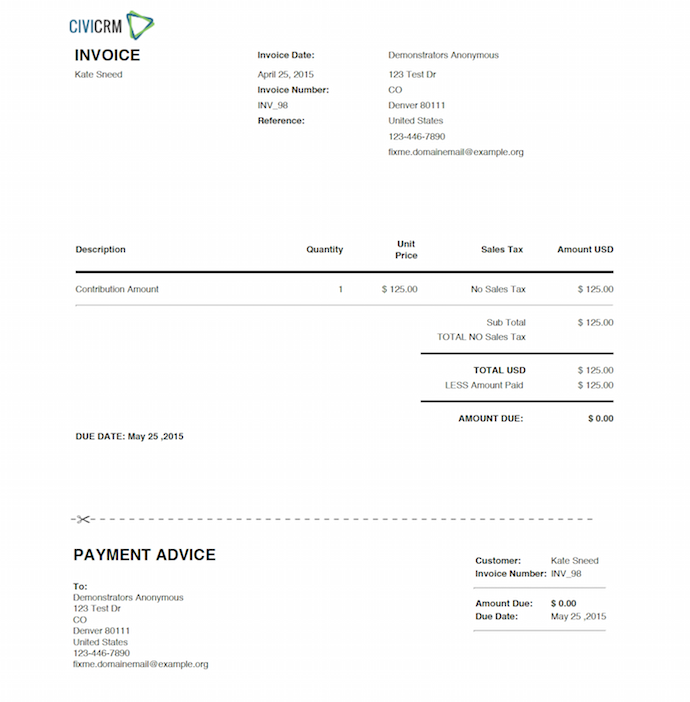 Once you are viewing the record you have the option to Print Invoice or Email Invoice. Printing an Invoice will download a pdf and Emailing an Invoice will provide an additional Options screen. Here is an example of a printed invoice. Invoices can be customized. The out of the box template code populates the Company Name, Address, and Website Information listed on the top right of invoices come directly from the Organization Address and Contact Info. To make any edits to this information, you can access it at Administer Console > Configuration Checklist > Organization Address and Contact Info. The look of the invoice and invoice image can be edited and customized in Administer > Communications > Message Templates > System Workflow Messages > Contributions-Invoice. To change the image on the invoice you will need to modify the code on line 10, replacing the image source (img src). For more advanced configuration with accounting software packages like QuickBooks, you should involve your organization's bookkeeper or accountant in setting up your Financial Types and Financial Accounts. See Accounting Integration and the Wiki Page for more information.